In 2008 I interviewed 34 about their motivations, and rewards, for hosting visits to their farms. 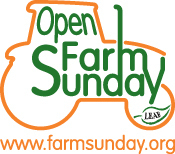 As we approach the month of “Open farm schooldays” and the weekend of Open Farm Sunday, when more than 400 farmers will open their doors to the public, it’s worth revisiting the reasons why they do so. A belief that that children need to be taken out of the classroom to experience different learning opportunities. “Education of children through hands-on visits to farms rather than books and academic work a better way”.